Who is ready for some chanukah cookies?! I’ve had this idea for ages. 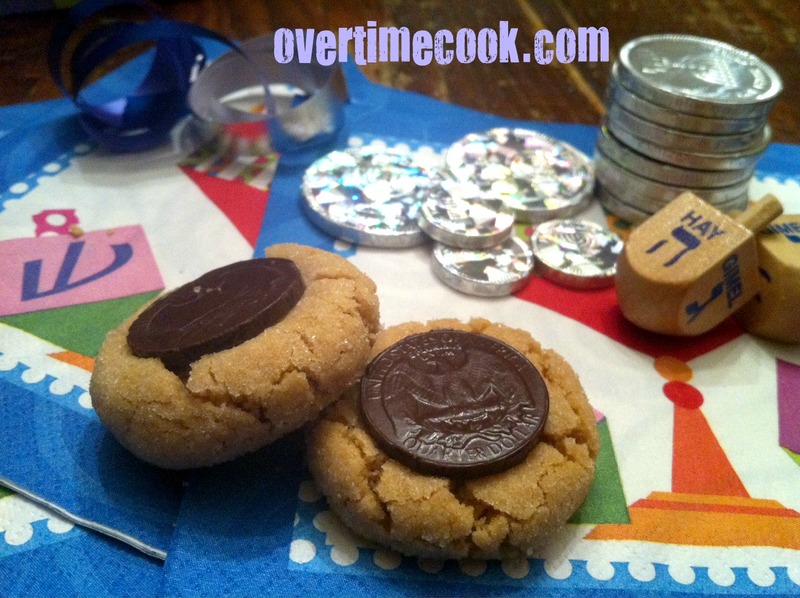 There are many cookies that involve pressing a chocolate or some other candy into the finished cookie, and a while ago I realized that a Chanukah chocolate coin would be the ultimate item to finish off a cookie for Chanukah. Finally, and idea hit me. I decided on what turned out to be a match made in heaven. Peanut butter blossom cookies, usually made with a Hershey’s kiss, aren’t generally something I can make, as Hershey’s kisses are dairy, and I bake non-dairy. 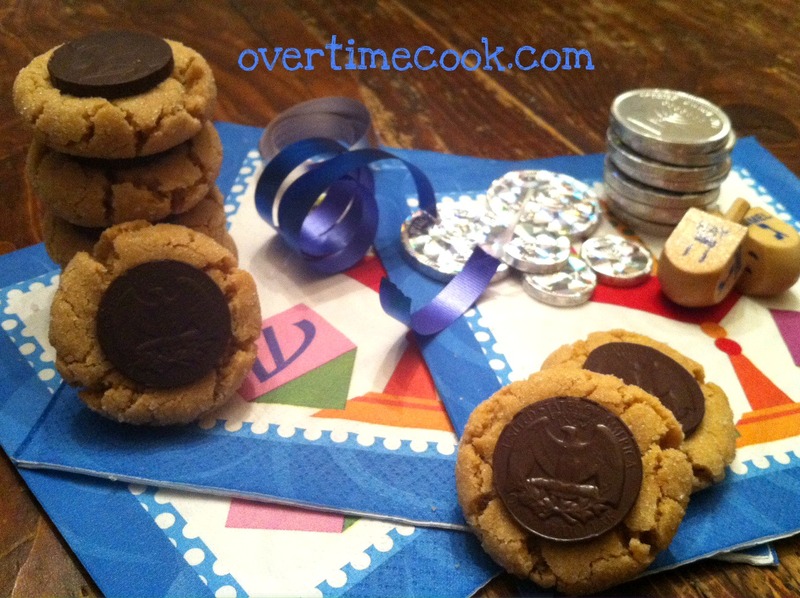 But with these chocolate coins, peanut butter blossoms with a lovely Chanukah twist were soon happening in my kitchen. If you can’t find chocolate coins, or prefer to use Hershey’s kisses, go ahead. These cookies will be delicious either way. After all, who doesn’t love peanut butter with a deliciously chocolatey seasonal twist? In the bowl of an electric mixer, beat together the peanut butter and shortening until combined. Add the granulated and brown sugar, and beat until light and fluffy. Add the egg, milk and vanilla extract, beating well after each addition. Turn the mixer to low, and slowly add the flour mixture. Stir until just combined. Using a small cookie scoop, or a teaspoon (or half Tablespoon) measuring spoon, scoop balls of dough about an inch in diameter. Roll the dough between your palms to create a neat ball, then roll in the sugar to coat. Place on ungreased cookie sheet. Repeat with remaining dough. Work with one tray at a time; bake the cookies about 2 inches apart on the cookie sheet and bake for 8-10 minutes. Remove from oven, and while hot, press an unwrapped chocolate coin into the center of the cookie. Make sure to press the chocolate far enough in to ensure that it will melt into the cookie a bit. Set cookies on a wire rack to cool. Do not touch the chocolate while the cookies are cooling, as it is soft and slightly melted at that point. They look delicious. So happy that you found the perfect insert for these cookies. Happy Chanukah to you and yours. These are crazy cool! I also made cookies today but I did the standard chanukah-themed cookie cutters type. I’ll be decorating them soon. You must have had such a fun time unwrapping 50 coins (that’s like the best part of eating them). Such a great and creative idea! And aside from looking great, these cookies are truly delicious! Really original idea for chanukah, like! So adorable! Gonna have to find time to bake these!! I made these cookies on Chanukah, but instead of those nice chocolate coins that you used, mine said Lieber’s across the front. It didn’t have quite the same effect, but they tasted really good anyway. Made these twice on Chanukah. They were amazing! Putting the recipe in my Chanukah box. We made our own coins using chocolate rounds. (I could send you a picture if you’d like.